You are here: HomenextTopicsnextViews of the city: images & opinionsnextMystery photos of Brighton and HovenextWhere was the PDSA? Another bygone photo for you from the museum collection. I seem to remember the PDSA being on the other side of the road. My dad bought me a bike for my Birthday at Strudwicks, it was definitely on the North side of Oxford Street back in the early 1960’s, the Strudwick shop is now on the South side of the road. The PDSA was in Oxford Street . Brighton. I looked at a 1951 Kelly’s street directory (random choice of year) to check this, and it confirms that the PDSA at that time was at 16 Oxford street, next door to Strudwicks cycles. The ’Prams for hire’ sign perhaps gives an indication of the austere years that imediately followed WW2. It looks like they are all queuing for the shop to open or something! Prams for hire, “Hard Times” but still enough in the kitty (excuse the pun) for their pets. I wonder what year, here goes my guess, late 40’s early 50’s, 1949!! Definitely in Oxford Street. My sister Audrey and I accompanied a friend to walk their dog to the PDSA to be put to sleep. in about 1947/8. We were all under the age of 12, and there wasn’t any query about it. It was very traumatic as the dog was put into a big metal container with a glass type lid, so you could see him. He was struggling and I have never forgotten it. I am now 79 and it still haunts me. I concur with my fellow Brightonians – north side of Oxford Street. The James Gray Collection has a photo of the PDSA dated 1966. I can’t remember when these buildings were demolished, though. 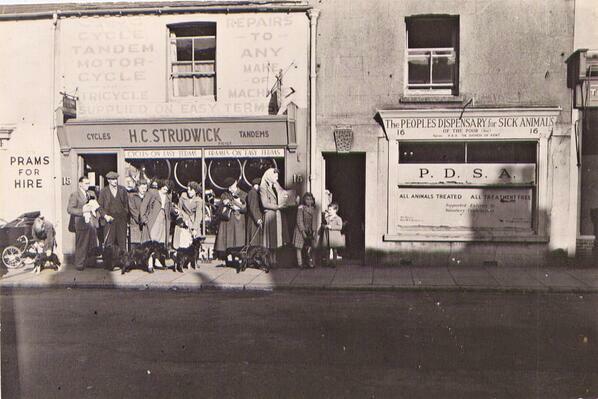 Strudwick’s Cycle shop was always good for window shopping in my early teens. They had bikes from three makers: Dawes, Raleigh and Claude Butler. At the time, we felt that the Dawes was more of a touring bike, Raleigh was a bit uncool and Claud Butler made real racing bikes. Looking back, they were, in fact, all much the same. In fact I think that Raleigh took over the names of Dawes and Claud Butler. The shop also did bike repairs. Once I had my bike (and nearly myself) run over by a coach. The front wheel was damaged beyond repair and the front forks were completely out of shape. Fortunately, the coach company paid for repairs and Studwick’s did a great job in bringing my bike back to life. Nos 15 and 16 are still there Janet, though the buildings to the right have been replaced. Alan. The PDSA was there for many people who couldn’t afford Vet’s bills. In 1969 my Mum scrimped and saved to buy us a puppy from the pet shop that was almost opposite. It was just after my Dad died and was a lifeline. The PDSA were there for us on many occasions. Anyone remember (my store) Southern Hobbies in Western Road. Long time ago now. Now 93 and going strong. They are queuing to go in the PDSA Peter Groves, they have animals with them. I believe it was free apart from a donation so no appointment and take your turn waiting to see the vet, first come first served.